Towards a New Russian Century? EDIT 11/27/08: Since writing this, I have come to realize that peak oil is real and will play a major role in any future scenario, and far sooner than the other three themes I highlight here. The twentieth century was, above all, a Russian century. Granted, Germany was the most important challenger Great Power in the first half of the century, while in the second the United States begun to assert itself on the world stage. Nonetheless, Russia, under its Soviet incarnation, was the key focal point of world history. It is hard to imagine a movement like Nazism arising in Germany, or indeed fascism in general, without the spectre of communism hanging over a country. Similarly, the US was only brought permanently out of its traditional isolationism by the Truman Doctrine – their pledge to “support free peoples who are resisting attempted subjugation by armed minorities or by outside pressures”, or, in other words, to contain communism. This article will be about Russia’s place in the world in around 30 years time. In particular, will it be able to reclaim its former mantle as a superpower? Does it have the potential to usher in a new Russian century? Firstly, we must define what a superpower is. Let us assume that it is a state with a leading position in the international system and the ability to influence events and project power on a worldwide scale. Furthermore, it must be strong on multiple planes of power – not only in the military sphere, but also in ‘softer’ areas like the economic base and cultural influence. Today, the world’s only country with the whole plethora of attributes – economic, technological, political, military and strategic – that make a state a superpower is the United States. Nonetheless, there are important trends at work that threaten to undermine this full-spectrum dominance. We have identified the three most important of these as economic (re)convergence, exponential growth in IT and global climate change. The most important of these is economic convergence. Given decent growth conditions and the appropriate human capital and physical infrastructure, per capita incomes should converge across nations via the diffusion of technology and best practice. This process has accelerated with progress in communications technology: while in the 19th C Sweden played catch-up at 1% growth per annum relative to Great Britain, today China closes its gap with the US at a rate of up to 8%. This means that, historically speaking, the world’s centres of economic power are shifting much more rapidly than at any time before. This trend is very positive for large countries with currently low per capita incomes like China and India, but negative for advanced industrial nations like the US, Japan and Germany. Their economic decline relative to Europe took centuries – a process that culminated in the industrial revolution, which saw these formerly proud empires relagated to being colonial appendages of the Western powers. The time has come for a great reverse. As a medium-income country, the effect will be slightly positive for Russia. Assuming there is no large-scale disruption of globalization in this century (as happened in the First World War and the rise of tariffs in the early 20th C), this trend should hold. Of course, it’s not sufficient merely to be behind to catch up. One must also have the human capital and physical infrastructure in place. One of the best proxies for human capital is education. 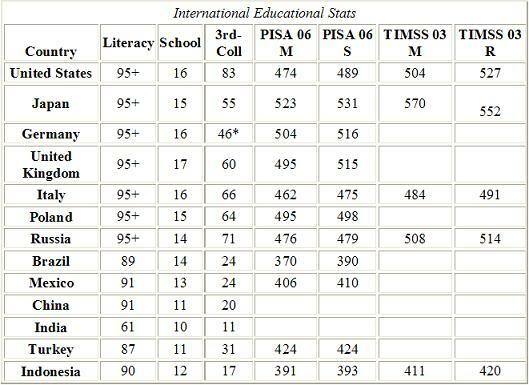 Sources: CIA World Factbook 2007 for literacy %; United Nations Statistics Division for school life expectancy (2005 or latest); World Bank for tertiary school enrollment (2005 or latest); PISA 2006 Math scores; PISA 2006 Science scores; TIMMS 2003 Math scores for 8th Graders; TIMSS 2003 Science scores for 8th Graders; * other source. Now as we can see from the info above, Russia’s (and eastern Europe’s) educational profile is of a First World character. Hence it is likely that the region’s impressive post-millennial growth will be sustained, resulting in convergence with west European countries by a 2020-30 time frame. A more comprehensive analysis of this phenomenom is given by Goldman Sachs’ GES (Growth Environment Score) and this seems to back up our fundamental points – namely, that China and Russia are better positioned for sustained growth than India or Brazil. (Russia recently overtook China in the GES). India will nonetheless grow quickly, despite its creaking infrastructure and poor human capital, simply because it is so far behind. Brazil, however, will not, because while it is a middle-income country, its human capital profile seems to dictate that that’s where it should stay. It will remain a land of promise. The same goes for the rest of South America and the Muslim world. It usually takes about a generation to effect real change in the human capital of a particular country. Hence, we think it unlikely that there will be any significant changes to the following picture – rapid convergence for China and eastern Europe with Russia, convergence from a low base of India and stagnation for all the other regions (in relative terms). In conclusion, China seems destined to become a third economic pole in the world by 2020, in addition to the United States and European Union. (According to the World Bank’s revised figures, China’s purchasing power parity GDP in 2005 was 5.3trn $, compared with the US’s 12.4trn $ and EU’s 13.0trn $. Assuming it manages to keep a 6-8% annual growth lead over them, it should become the world’s largest economy by 2020). India will also become much larger, but its overall size will be comparable to Japan’s – furthermore, the same development pattern that we see today (islands of IT-based prosperity in a sea of poverty) will be preserved, and its per capita income will remain extremely low. Russia and eastern Europe, on the other hand, are likely to converge to west European levels of development by 2030. While Russia’s overall economy will remain small as a percentage of world GDP (around 4-5%, up from 3.4% today), it will be fully developed with a strong high-tech mainstay. The second global trend is the doubly exponential growth in IT. Economic growth has been with us since the dawn of history, although it took us a long time to realize this. Furthermore, it is not only exponential (ie, growing by x % per annum) – it is doubly exponential (x itself increases exponentially). The reason it took us such a long time to recognize this fundamental fact is that in the beginning, growth was very slow (a fraction of a percent per annum, as late as medieval times), so we perceived it as being linear instead of exponential. (The futurist Ray Kurzweil calls it the intuitive linear view versus the historical exponential view. His article The Law of Accelerating Returns is highly recommended). 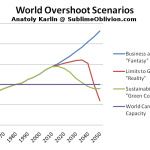 However, during this century Moore’s Law in computing – that the number of transistors that can be inexpensively placed on an integrated circuit is increasing exponentially, doubling approximately every two years – has become well known. Furthermore, it is doubly exponential growth – while calculations / second / $ doubled once every 3 years in the 1950’s, the doubling time decreased to 2 years in the 1980’s and is currently at 1.5 years. The same general pattern can be discerned in world economic history. In medieval and early modern times, all societies’ per capita income grew at a rate just a little above 0%, and this fact was concealed by much stronger cyclical and chaotic tendencies. However, leading industrial countries grew by 1% per annum in the late 19th C per capita, while today this has increased to 2-3% per annum. As more and more of the components that are governed by Moore’s Law enter our manufactures (GPS in cars, etc) and services (automated banking, etc), so will the growth rate of the real economy increase faster and faster. The case can be made that the Great Powers of this century will be determined by such things as R&D spending and personnel, nanotechnology spending and supercomputer production; just as the Great Powers of yesteryear focused their energies on steel, coal and engines. Not only will they generate the Kondratieff wave of economic growth for the next 50 years, they will give the states that nourish them capabilities that will fundamentally alter the strategic landscape. Powerful computers can be used to construct a truly effective missile defence; nanotechnologies can create very strong body armor (the US plans to roll out a suit that integrates nanotechnology exoskelotons and liquid body armor by 2020, as part of its Future Force Warrior project. A number of other countries have similar programs). Furthermore, nanotechnology can also be used to mitigate the effects of the third trend – climate change – by releasing light-reflecting aerosols into the atmosphere or even mass producing molecular machines that break down greenhouse gases into harmless components. Eventually, true engines of creation (molecular self-assemblers) have the potential to radically transform every facet of everyday life through the dematerialization of production and elimination of material scarcity. A computer that can pass the Turing test also lies on the horizon, and its development will unleash “an exponential runaway beyond any hope of control“. After all, superintelligence is the last invention man need ever make. Now scrutinizing these forecasts is beyond the scope of this blog, let alone this article. We will refer you to Kurzweil’s Law of Accelerating Returns and the excellent The Futurist blog, and leave it at that. 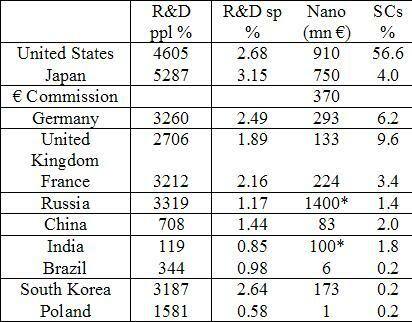 Sources: World Development Indicators database (2004 or latest) for R&D, ppl % is researchers / million people, sp % is spending as % of GDP; public nanotechnology funding 2003 in millions of Euros; countries’ % share of top 500 supercomputers as of 11/2007. * These are my estimations (2007 spending), based on these articles: India’s nanotech spending below global levels (India spends less than Taiwan which spends 104bn $) and Russia Pours Billions in Oil Profits Into Nanotech Race (Russia to spend 7bn $ in next 5 years). This table illustrates how strong today’s leading countries are in the leading spheres of the high-tech industries. The United States has a commanding lead. It has an excellent R&D infrastructure, with most of the world’s best universities (as defined by Shanghai Jiao Tong University). It has more than half of the world’s most powerful (ability to do calculations quickly) supercomputers – if anything, their lead is underestimated, since all the major vendors that manufacture these supercomputers (IBM, Hewlett-Packard, Cray Inc., Dell, SGI) are American. Its high government spending on nanotechnology conceals an even larger amount of private spending, as can be deduced from the diagram below. The only other country roughly comparable to the US is Japan (while Japanese supercomputers are less powerful, they beat American ones on efficiency). Although small, individual European countries like Sweden or the Netherlands are also comparable to the US, Europe as a region is weighed down by technological laggards like Italy, Portugal and central-east Europe in general. 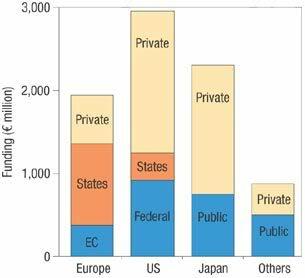 Although the large European states spend a lot on nanotechnology (as does Russia from 2007), there is relatively very little private enterprise in this area. Amongst the BRICs, China and Russia look like they have promising futures in high-tech; the same cannot be said of India and Brazil, notwithstanding all the recent hype about the former’s flourishing IT industry (which is mostly based on Western out-shoring of cheap services, rather than true innovation). In conclusion, the US and Japan look set to continue dominating these high-tech industries, although the US will continue to make most of the conceptual innovations. There will also be regions of the world (Taiwan, South Korea, Israel) that will occupy strong niche positions. The big European countries will lag, although Russia has the potential to break through to a leading position (its government has recognized nanotechnology as a national strategic priority, allocated massive funds to it and is seeking to build a hi-tech venture capital industry to attract private investment). China might converge to Europe in this field, but India will likely and Brazil will certainly remain substantially behind. The final major trend for the medium to long-term global future is that of climate change. Historically speaking, global warming has followed the ‘high’ scenarios of climate models since they were first seriously constructed in the 1980’s. Nonetheless, even they might have underestimated the risk and magnitutude of catastrophic climate change. The Earth has many feedback mechanisms that could make runaway global warming a real possibility. Increased heat due to CO2 emissions will unleash the methane underneath the Siberian permafrost, accelerate forest decay in the tropics and melt the frozen methane clathrates that lie beneath the world’s ocean sediments. Think of these as primed explosives, CO2 levels as the fuse. Beyond this global climate tipping point, there is no turning back – and the Pentagon, being substantially wiser than the Bush administration, seems to have taken note. There is even evidence that the true magnitude of global warming to date has not been fully appreciated due to global dimming – the ‘sunshade’ that emissions of soot particles create over our heads. Transportation access will be greatly improved by new transcontinental railways, and as the rivers leading into the interior have become more or less ice-free, this area will be able to reap the benefits of the enormous shipping traffic along the North Siberian border. The effect on Europe as a whole will be neutral, since the cancelling of the Gulf Stream will be counteracted by generalized warming (although Italy, the Balkans and Iberian peninsula will face drought and maybe even desertification). On the other hand huge new areas will be opened up in the north. In North America, although the West will face desertification, new areas will be opened up in Canada to compensate. China and India will be very badly affected, both facing severe water shortages and inundation of the coastlines and river valleys (Ganges, Yangtze, Huang Ho) where most of their people live. While Europe and the US will also face inundations as the Greenland and West Antarctic icecaps melt, the extent will be more limited (mostly the Netherlands and Florida). Below is a fun applet you can play with to simulate various states of sea level rise. In conclusion, in a warming world the US, Europe and Brazil will weather the storm, while Russia will benefit not only relatively, but absolutely. China and India will have to devote massive amounts of state resources on mitigating its effects, and questions have to be asked whether they will even be able to feed themselves. China’s northern breadbasket is turning into a dustbowl and its wheat production has been falling for the last decade, while global grain stocks have also dipped in the last 5 years under a barrage of drought and crop diseases. Outright famine is unlikely, we think – after all, China is fast becoming a medium-income country, and there is room to cut back on food consumption by reducing the proportion of meat in the people’s diet (which has been the primary cause of rising global food demand, rather than population increase). In any case, it appears that there will be a need for a massive migration from overpopulated southern countries to the north to prevent a catastrophic disparity in global wealth and resources. (As such climate change will act counter to the equalizing tendencies of economic convergence). It is reasonable to imagine Canada and Russia filling up with tens, eventually even hundreds, of millions of immigrants from the stricken zones to the South – provided they accept their moral duty to let them in. If they don’t, there will probably be intense wars over dwindling resources in the south, possibly involving the use of nuclear weapons, from which the rich northern countries will be unable to insulate themselves from. As we come close to the end of our analysis of the three trends – economic convergence, technological progress and climate change – that will shape world geopolitics this century, it is time for a summary of the main findings. The US, as today’s single superpower, will be challenged by economic convergence on the part of emerging markets like the BRICs. Nonetheless, it will not be catastrophically affected by global climate change and its extraordinary strength in hi-tech should stand it in good stead for the next few decades. It will preserve its vast strategic strength (nuclear arms), power-projection capabilities and cultural influence. Russia will re-emerge as a superpower due to economic convergence and above all global warming, which will shift global shipping to the Arctic, open up vast new energy sources and make the Siberian interior habitable on a sustainable basis. It has the potential to break through and become a leader in hi-tech industries. Economic convergence should see its per capita incomes approach, and possibly overtake, those of European countries within a generation – nonetheless, its overall economic weight in the world will remain modest. It will preserve its vast strategic strength (the equivalent of the US), should have gone some way towards developing power-projection capabilities and most importantly it will be the only Great Power with surplus energy and mineral reserves. China will be the world’s largest economy in purchasing power parity by 2020 at the latest, although it will continue to lag in per capita terms. The development of a comprehensive R&D network should allow the creation of a truly independent, comprehensive military industrial complex, thus joining the US and Russia in that regard. Nonetheless, it will be very negatively affected by climate change, and unless a technological solution is found to this problem, its government will be increasingly pre-occupied with mitigating the consequences of global warming – desertification and inundation. China also plans to build power-projection capabilities (hi-tech forces capable of winning localized wars against technologically advanced adversaries (read: the US)) and increase the size and comprehensiveness of its strategic deterrance. The European Union has all the pre-requisites of superpowerdom, but the million-dollar question is whether they will succeed in uniting into a truly federal state with one independent, European foreign policy and an integrated military-industrial complex. Such an outcome looks unlikely at present (what with France’s and Belgium’s rejection of the European Constitution), and that is unlikely to change, especially as the EU expands to take in the Balkans and maybe even Turkey. As it stands, however, like the old Polish-Lithuanian Union, Europeans can be manipulated against each other by the powers to the east and west (Russia and the US), which are stronger than any individual European state. There is no question of Japan, India or Brazil becoming a superpower. Japan is developed and technologically advanced, but it does not have the public will to become militarized and actively project hard power over its own region, let alone the world. It has no energy resources and is vulnerable to being cut off from energy and food imports; nor does it possess a strategic deterrant. India has all of China’s problems and fewer of its advantages (its human capital is much lower, the infrastructure is poor and it is already more than a decade behind in per capita income). Brazil can be energy independent and it has a respectable industrial base, but it has no room for convergence (due to its low human capital) and only a scant R&D infrastructure. It has neither the capability nor the will to project its influence beyond its borders. Our prediction is that by 2030, there will emerge a tripolar world dominated by the US, China and Russia. As we have shown, all these countries possess the means or the potential to acquire the means to acquire superpower status. Their populations, we believe, also have the will to achieve this. As a proxy for this, let us take the World Values Survey results to the question, “E012.- E012.- Of course, we all hope that there will not be another war, but if it were to come to that, would you be willing to fight for your country?” 97% of Chinese, 77% of Russians and 73% of Americans answered in the affirmative. In Europe, on the other hand, these figures were typically in the 40-60% range. If half of them say that they’re unwilling to fight for their own country, how many of them will struggle for a united Europe? Japan scores just 25% – a reflection of its pacifist, non-interventionist foreign policy. While both Brazil (72%) and especially India (82%) have the will to be superpowers, they will be unable to acquire the capability in the foreseeable future. Fast forward to 2030. What do we see? The United States is still a, if not the, leading economy. In absolute size it has long been overtaken by China. Both states possess respectable power projection capabilities, the technological and economic base to sustain them and a strategic deterrant. China devotes most of its energies to acquiring the energy, mineral and food resources to feed its bourgeoning economy, and in mitigating the effects of climate change. The US is affected by these two problems to a much lesser extent. Russia is an economic minnow next to Europe, the US and China because of its relatively small population. In economic size and technological development it is comparable to Japan (a basic fact which will not change even if it were to expand to incorporate the Ukraine, Belarus and Kazakhstan). However, it will also possess a strategic deterrant, power projection capabilities and the will to use it. It is entirely self-sufficient in energy, agriculture and minerals, and can export surplus production. In a world which faces energy shortages, this will become an increasing important foreign policy level – on the largest scale, it means that Russia will be able to play off China and European US allies off against each other. In the Israeli parliament, the Knesset, there is a socially conservative party called Shas. They only ever win small mandates, but since there is usually a narrow margin between the two main parties (traditionally Labor and Likud), they have the ability to tilt the balance of power one way or another. As such, they can exercise influence on Israeli politics out of all proportion to their numbers. Russia seems destined to be the world’s Shas this century, balancing Chinese and American power. As of today, the US is much stronger, which might explain why Russia and China have banded together in the Shanghai Cooperation Organization. As both countries increase their Comprehensive National Power, it is likely their friendship will be revealed for what it is – a temporary marriage of convenience. The Soviet Union never came close to being the world’s foremost economic power, yet it exerted its influence on the world through its ideological fervor and military might. In the new century, Russia can add energy dominance to its trumps. Provided it retains its traditional will to power, the next century may well be a Russian one. Note: under the nanotechnology spending column in the Hi-Tech Table, Russia should be at 1000 mn Euros rather than 1400 mn. (I forgot to convert the dollar figure and can’t be bothered correcting the table). Do you have any? Please comment and I’ll try to answer them. Edit: there were objections criticisms from peak oil, US debt and demographics. I have tried to counter them in Mailbag: Back from a Russian Century? Edit 2: for more on the vital link between economic development and education, please consult my article Education as the Elixir of Growth. Mailbag: Back from a Russian Century?